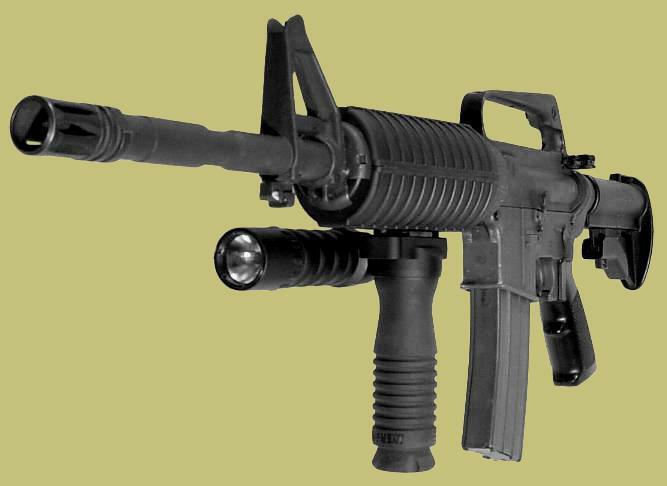 AR-15, CAR-15, M4 or M16 style rifle or carbine. to the rifle without an attachment rail. No tools, disassembly or weapon modification required. two ventilation ports at the turn of a locking knob. Positioned on the forearm where preferred. Attach/remove in silence, in the dark, in seconds. Enhance weapon operation, safety, and maneuverability while switching to another weapon quickly and easily. - UV stabilized (designed for outdoor use). The RMgrip features an integrated, removable, flashlight accessory configurable for right or left-handed users. The RMgrip Product Line is 100% made in the USA. RM Equipment is a Veteran Owned Company. RM® Equipment Inc. is a Veteran Owned Company. RM® and the "Bang" are Registered Trade Marks and may not be used without written permission from RM Equipment, Inc. © 2012 RM® Equipment, Inc.
Key words for website: AR-15 vertical handgrip, CAR-15 vertical handgrip, M4 vertical handgrip, M16 vertical handgrip, rifle vertical handgrip, carbine vertical handgrip, AR-15 hand grip, CAR-15 hand grip, M4 hand grip, M16 hand grip, rifle hand grip, carbine hand grip, AR-15 handgrip, CAR-15 handgrip, M4 handgrip, M16 handgrip, rifle handgrip, carbine handgrip, rifle vertical fore grip, M16 vertical fore grip, M4 vertical fore grip.